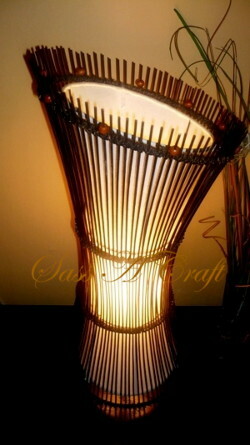 Beaded Lamp | Sass a Craft - Muslim Women are Smart & Crafty Too! I decided to dress my lamp up with large-holed, Burnt Orange wooden beads. Nothing over the top, but I love it. The mere sight of my favorite earth tone is all that it takes to bring about quiescence – well that and a hot cup of tea. I may weave something around the middle of the lamp to give it some flair. Enjoy for now! Maa Shaa Allaah, Tabaarakallaah. It took me longer to take the photo than it did to bead the lamp (smile).